In the large-scale gold mining industry, toxic cyanide is often used to recover gold from the earth. Small mining firms typically do not use cyanide, but their gold recovery practices are far less efficient, with miners losing up to half of the gold that they mine. As a whole, the industry faces challenges relating to resource size, transport costs, stringent regulatory approvals processes, and environmental constraints. 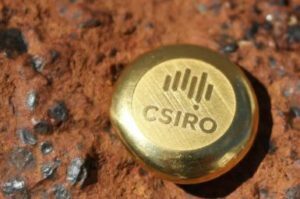 A gold ingot produced from the first gold extracted by the demonstration plant (Source: CSIRO). The SIEF Experimental Development Program (EDP) will support the development of market-ready, proprietary, non-toxic gold recovery products. SIEF funds will support the construction and operation of a mobile pilot plant that will demonstrate recovery of gold using the non-toxic products from various gold ores in the field at scale. A team of specialists from CSIRO and Eco Minerals Research Ltd will contribute expertise in research and development, process engineering and construction, mineral processing, chemistry, and process piloting, to demonstrate the technology. Increasing the economic value of gold recovery markets, with an estimated $3 billion per annum of additional gold production in Australia and more than US$30 billion per annum worldwide. Reducing environmental risks of gold mining and mitigating the very high costs of safely managing cyanide. Increasing the business potential of small-scale gold mining firms which use sustainable business practices, with flow-on social and economic benefits to regional communities.